Ernest Hodgson, an international leader in the field of toxicology, passed away Oct. 10 in Raleigh. 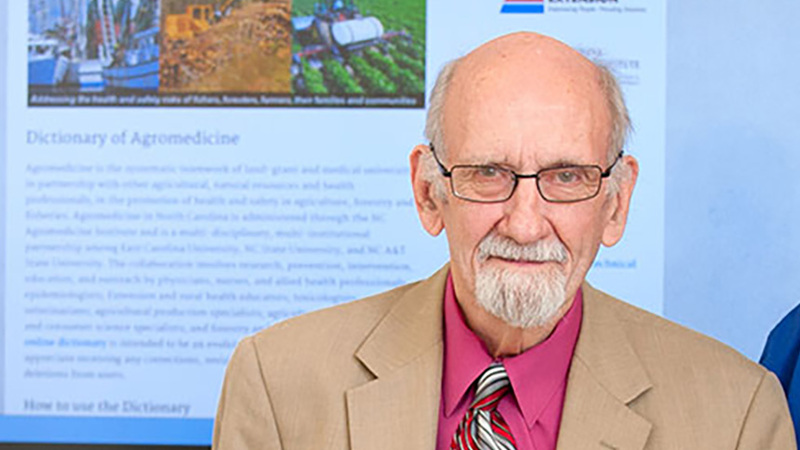 Dr. Ernest Hodgson, a William Neal Reynolds Distinguished Professor of Toxicology, a founder of the North Carolina Agromedicine Institute and the first head of NC State’s Department of Toxicology, passed away earlier this month. An internationally recognized expert in biochemical toxicology research, outreach and education who was widely recognized for service to his profession, Hodgson died Oct. 10, 2018, in Raleigh. He was preceded in death by his wife of 42 years, Mary K. Devlin Hodgson, and is survived by four children and four grandchildren. Hodgson joined NC State’s College of Agriculture and Life Sciences faculty in 1961 as an assistant professor of entomology. He was named a William Reynolds Distinguished Professor in 1977, and he was appointed to serve as head of the Department of Toxicology when it was formed at NC State in 1989. He later moved to the Department of Applied Ecology, where he remained until 2018. Hodgson was born in 1932 in Hetton-le-Hole, Durham, England. He earned his undergraduate degree from King’s College of the University of Durham (now Newcastle University, B. Sc. with Honors) and his Ph.D. from Oregon State University. Then he joined the University of Wisconsin, Madison, as a postdoctoral fellow. While at NC State, he was editor and co-author of two toxicology textbooks and helped create the “Dictionary of Toxicology” and the “Dictionary of Agromedicine.” He also won numerous awards, including the Distinguished Toxicology Scholar Award from the Society of Toxicology, an international organization of scientists from academic institutions, government and industry. He has won prestigious awards from the American Chemical Society and the International Society for the Society of the Xenobiotics and was the latter’s past president. In 1996 Hodgson received the O. Max Gardner Award, an annual award given by the 17-campus Consolidated University of North Carolina. The award goes to one faculty member considered to have made the greatest contribution to the welfare of the human race in the past year. He also received NC State’s highest faculty honor, the Alexander Quarles Holladay Medal for Excellence. Hodgson was one of the organizers of the North Carolina Agromedicine Institute, a partnership of NC State University, N.C. A&T State University and East Carolina dedicated to identifying and addressing the health and safety risks of farmers, foresters, fishermen, their families and communities in North Carolina. His memorial celebration will take place on Sunday Nov. 18 from 1 to 4 p.m. at the NC State Park Alumni Center on the North Carolina State University Centennial Campus, 2450 Alumni Drive, Raleigh, NC 27606. Memorial contributions in Hodgson’s honor or in lieu of flowers may be made to the Foundation for Agromedicine and Toxicology Fund or the Ernest Hodgson Agromedicine and Toxicology Lecture Program Endowment. Tax-deductible gifts may be made online at go.ncsu.edu/ernie-hodgson-memorials or by sending a check payable to N.C. Agricultural Foundation (note Foundation for Agromed/Tox or. Hodgson Lecture Fund in the memo line) to: NC Ag Fdn, Campus Box 7645, Raleigh NC 27695-7645.